How to “SPOT” Trucks Carrying Hazardous Materials on Highways during Road Trips? I travel to NJ by car frequently for long weekends. This past summer, I took a long road trip from Northern Virginia to New England. This large span of highway took me close to ten hours in my personal vehicle without traffic delays or any traffic-related accidents. On these trips I often encounter the now familiar visions of red brake/tail lights in front of me, and hear the screeching of brakes coming from somewhere around me and hope/pray that the other vehicle is not near me. Sometimes these massive slow-downs are a result of a car fire, a traffic accident with multiple vehicles, or bumper-to-bumper traffic due to people viewing a recent incident on the other side of the highway. They often arrive after the incident has taken place. Aside from their sense of smell, how do they know what type of hazardous material is on the roadway? Are all chemical spills treated the same way? According to the Department of Transportation (US DOT), Federal Highway Administration’s publication targeted at First Responders titled “Traffic Incident Management in Hazardous Materials: Spills in Incident Clearance”. The Federal Highway Administration’s mission is to “Keep America Moving”. Traffic Incident Management (TIM) and spill management are two of the tools in the “resource toolbox” that focus on reducing congestion. The purpose of this document is to report practices regarding the clean-up of incidental spills and to explain the use of the United States Department of Transportation’s (U.S. DOT) Emergency Response Guidebook (ERG). 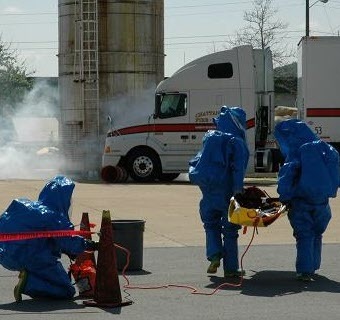 This document also describes techniques and strategies that can be used to handle hazardous material spills at traffic incidents. Current research indicates that hazardous materials traffic in the U.S. now exceeds 800,000 shipments per day. When you think about how many trucks you see while driving on the highways and airplanes flying overhead daily, that is an abundance of hazardous materials being transported! The largest tank volume is the saddle tank (normally 70 gallons) on a semi-truck. Depending on the number of tanks on the truck, the maximum capacity for fuel for a commercial vehicle can be as much as 350 to 420 gallons! Under the DOT’s Hazardous Materials Regulations notations included in this guide, (HMR; 49 CFR Parts 171-180) hazardous materials are categorized by analysis and experience into hazard classes and packing groups. Each shipper is required to classify a material according to these hazard classes and packing groups and communicate the material’s hazards. The shipper repetitively communicates the hazard through the use of package labels, shipping papers, and placards on transport vehicles. The DOT has broad jurisdiction to regulate hazardous materials that are in transport, including the discretion to decide which materials shall be classified as “hazardous.” These materials are placed in one of nine (9) hazard classes based on their chemical and physical properties. Therefore, it’s important for response personnel to understand the hazard classes, their divisions, and reclassified materials so they can assess the situation and respond, accordingly. You can find this Transportation Incident Management in Hazardous Materials Spills in Incident Clearance print book available at the US Government Printing Office Overstock Sale here. While supplies last, you can check out all the titles in our 50% Off Overstock collection here. Our Overstock Sale includes an assortment of print and eBook titles discounted by 50% from the list price ranging in topical categories from military history …. to transportation …. to health resources ….. to childcare …… check out this clearance sale today! About the Author – This week’s blog contributor is Maureen Whelan, Senior Marketing Team Leader for GPO’s Publication & Information Sales division in Washington, DC. Maureen oversees print and digital content dissemination strategy and manages third party free and paid content distribution vendors such as Apple iBookstore, Google Play eBookstore, EBSCOhost, Overdrive, and more. This entry was posted on Wednesday, October 1st, 2014 at 2:36 pm and is filed under Consumers, Department of Transportation, Emergency Response, Travel and Tourism. You can follow any responses to this entry through the RSS 2.0 feed. You can leave a response, or trackback from your own site.